Everything you need to know about cottage rental and a whole lot more !!! This Newsletter is for Cottage Owners and Cottage Renters alike !!! So here we are again, and everyone is chomping at the bit to experience some warmer weather and to start planning for another summer vacation. Undoubtedly, some of you are going to do what you do every year and that is to rent a cottage in Central Ontario. On the other hand there are many of you who have never rented a cottage before but who are giving cottage rental some serious consideration. Hopefully if you decide on renting a cottage you will be renting your cottage through WRD but whoever you rent from, we are sure you will have a great time at the cottage ..... or will you? As a rental agency, we have been arranging cottage vacations for 24 years and as such we can say that you can rent what appears to be the most beautiful cottage there is, but if you are not prepared for what to expect in cottage country, your experience may be less than anticipated. For example, if you have grown up in the city with all of the city conveniences, you may find cottage life rather difficult unless you prepare in advance for this new cottage experience. And this is what this newsletter is all about. We want your cottage experience to be all that it can be. So don't be afraid to ask any question you want about cottage rental. Simply send an e-mail with your question to bill@ontariocottagerental.com and you will receive an answer back or your question will be answered in the next update of the WRD Cottage Rental Newsletter. Question : Where is the best place to rent a cottage in Ontario? Answer : There is no best place to rent. Those who normally stay in the Muskokas think that the Muskokas are best and those who rent cottages in the Haliburton Highlands think that there is no other place in Ontario like the Highlands. Both of these areas will get an argument from people who have cottages in the Ottawa Valley or Southeastern Ontario. The bottom line is that beauty is in the eye of the beholder. All of these areas and a whole lot more have wonderful cottages for every pocketbook. I think a key consideration most renters have is how far they are willing to travel to get to their cottage. A 2 1/2 hour drive seems to be the limit of most renters. And if you have kids like mine when they were very young, I didn't reach the end of the driveway before they started asking, " are we there yet" ? Question : What is the best way to find a rental cottage? Answer: We may be a bit biased but as a cottage rental agency, we know that we work hard to match our clients needs to one of our cottages. However, there are a multitude of rental agencies on the internet so beware. Choose an agency which rents cottages and nothing else. Make sure that the agency operates out of the area where their cottages are located. Many of these new agencies operate off shore and have little or no knowledge about the area where the cottage is located. Pick an agency which has been in the business for at least 5 years and who are able to answer in depth questions about their cottages. Ask the agency where their office is and ask directions to their office. If they seem to operate out of their home, be careful, they could be here today and gone tomorrow. One last observation, I can say to you that if I was looking for a rental cottage today, I would not rent a cottage directly from the cottage owner. Every summer we see or hear horror stories about people who have rented from owners, and who have paid their money only to find out that the cottage is nothing like described or pictured on the internet. I really feel sorry for these people and when these folks come to us, we try hard to salvage their vacations and find them a cottage which their family will enjoy. Don't get me wrong, not all owners of cottages operate this way but if you don't know the owner, how are you to know for sure. Question: "Why is cottage rental so popular, when should I start looking for a cottage and how much can I expect to spend for a good cottage?" Answer: The popularity of cottage rental is pure economics. For example, our average executive cottage rents for $2830 per week. That may sound like a lot but if you consider that the average executive cottage sleeps 9.5 people, this means that the average executive cottage ends up costing $42.55 per person per night. 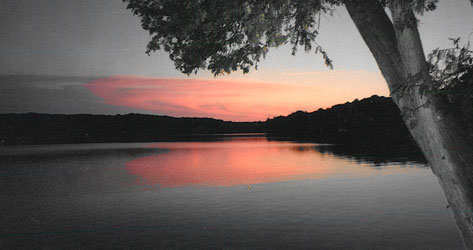 Where else can you stay in this world for less than $43 a night and on a lake with absolute privacy. Cottage rental is so popular because it's a great deal, simple as that. If you don't believe me, figure out what your last family vacation to Cuba or Cancun Mexico cost you per person, per night. Scary isn't. With regards to when you should start looking for a cottage, this is also tied to the popularity of cottage rental. Since we started this business 24 years ago, people are reserving their cottages earlier and earlier every year. Therefore you should start to look in December or January for your summer rental cottage. It seems that as soon as New Years is out of the way, everybody starts getting real serious about their summer vacation plans. As far as what you can expect to pay for a nice cottage, let's say you have a family of 5 and the grand parents will be joining you and if you were to pay $35 per person per night for a week, it would cost you just over $1700 for your accommodation. I suggest that you have a look on this web site at our cottages priced around $1700 that will sleep 7 and I think you will agree that they are really nice. Question - What do we need to bring to the cottage ? Answer : Just about everything you will need for a great vacation is supplied. The only things you will have to bring are your own sheets, pillow cases, towels and face cloth's and life jackets. The reason we ask you to supply your own life jackets is because it would be almost impossible for the owner of the cottage to supply all the different sizes of life jackets that would be needed by your group and all the other groups that will rent the cottage. A life jacket is a very personal thing and as such, you and your children should be fitted for the right size life jacket to ensure your safety and that of your children. In addition to the above, you will need to bring your own food and drink and personal hygiene items. However, there are large food stores in the villages so don't think that you will need to bring all your food from home. The same is true for beer, wine and liquor. 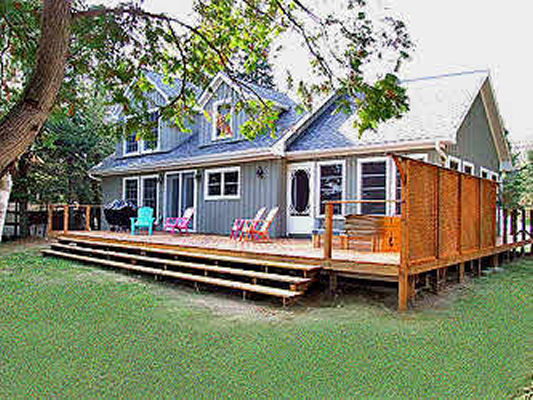 Question - When listing my cottage with a rental agency, why are some rental agencies so cheap. 1) The agency should respond quickly to all inquiries to rent your cottage. 2) All contracts with the renter should be handled by the agency. 2B) The agency should screen the potential renter's booking application to ensure accuracy of the information and that this renter/cottage match is a good fit for all concerned. 3) Once the booking application is approved, all money transfers should be handled by the agency including down payment, final payment and security deposit and the agency should accept payment by all major credit cards. 4) While the renter is in residence in the cottage, all problems, if any, should be handled by the agency. In the case of WRD, even after hours calls are routed to the residences of the President of WRD and / or the General Manager. In other words there is always a live voice at any time of the day or night if a renter calls WRD needing assistance. 5) After the renter leaves the cottage at the end of their vacation, the agency should ensure that the cottage and property is ready for the next renter. 6) A quality agency will survey the client to ensure that they enjoyed their vacation and should ask for suggestions to make the stay at this particular cottage even better than they experienced. If the above tasks are performed professionally, you can see why full service agencies charge what they do for these services. Each and every rental of a cottage from WRD goes through a 26 step process to ensure the satisfaction of the client. Cottage rental is more complex than people think if it is done right. It requires professionalism, dedication and a staff who are conscientious and responsive to the needs of the owner and renters alike. 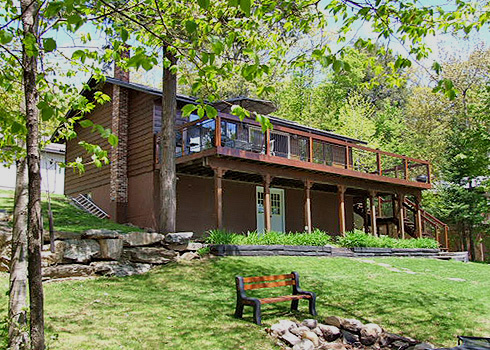 Question: I have visited a lot of cottage rental web sites and it becomes very confusing when trying to determine value for my rental dollar. How do I know that the rental rate on a particular cottage is fair? cottage etc., etc. By the time a cottage appears on our web site, we have a very good idea as to what that cottage is worth and that the cottage has gone through a professional evaluation and scrutiny to determine the rental rate. In the final analysis, there is no such thing as the perfect cottage and we take all negatives and all positives into account when pricing a cottage. Question: We recently received a question as to why there is a limit on the number of renters in a cottage. Answer: There are a number of reasons but the primary reason is because when the cottage was built, the contractors installed a septic system which was big enough to handle the number of bedrooms or the number of people who would be in the cottage at any one time. Lets say that the cottage septic system is sized or designed to handle 8 people. Unlike your residence back in the city, all waste which goes in the toilets, sinks, bath tubs, washing machines and dishwashers goes to the septic system and therefore will stay on the cottage property while being processed by that septic system. As with any other system, there is a limit as to how much waste a septic can handle and it is determined by how many toilet flushes there have been, how many baths and showers have been taken, how many loads of wash have been done in the washing machine and how many loads of dishes have been washed in the dishwasher. As a renter at this cottage, you can do certain things to limit the possible problems with the septic by not flushing the toilet after every use, spacing out the baths and showers taken, not using the dishwasher when only half full and by doing only one load of clothes washing per day. Believe us when we say that you do not want septic problems during your vacation because more likely than not, you will have to move to another cottage if one is available. In addition, it is absolutely important that nothing is put down the toilet other than human waste - no sanitary napkins, no grease, no cloth material of any kind and no children's toys of any kind. The reason is that all waste is pumped from the cottage to the septic system and anything like the aforementioned products will get stuck in the pumping system resulting in the pump needing to be serviced and maybe replaced. I must say as a cottage rental agency, we do not take kindly to a group of renters who exceeds the number of people in their group as stated on the rental contract for the above reasons. Your cooperation in this matter is vital and indeed very much appreciated. Question: What is the true difference between rental agencies i.e. : WRD Cottage Rental, Airbnb or Home Away etc; etc. ? Answer: I am so happy you have asked this question because there is much confusion when it comes to deciding on a rental agency. I think that the number one criteria should be which agency provides the best information needed for a potential renter to make an informed decision when evaluating one cottage versus another. Basically, there are 3 major groups of companies who offer cottages to rent. 1) There is the full service agency which is what WRD Cottage Rental Agency is all about. 2) There is the large platform advertiser such as Airbnb, Home Away and Canada Stays for example. the three are like night and day !!! they do not vet (interview) their renters before they arrive at a cottage. The only question they ask of a potential renter is if they have an active credit card. To us here at WRD, this is a really risky approach to cottage rental. was a tough one indeed. "For the past 8 years we have used WRD to rent our cottage in Haliburton. Our experience has been outstanding. Bill and the staff at WRD are most helpful, courteous and effective at securing qualified rentals. When we first decided to rent our cottage we had some concerns as to how it would work out. We have now had over 50 rentals and have been very pleased with the marketing of our cottage, the suitability of renters and the overall rental experience. Great work WRD!" "Six years ago, we purchased a cottage with the intention of renting it and chose WRD Cottage Rental Agency to represent us. We are happy to say that we have been fully rented each and every summer as well as many winter rentals. We have been so pleased with the performance and service we received from WRD, that we have purchased another rental cottage and with the help of WRD, we are confident it will be a success as well." "Our cottage is our special place, and the idea of renting it out was uncomfortable for us. We have been with WRD for 11 years now and all our fears have waned. Now we are happy to share our cottage with approved renters from WRD. They all have been easy to deal with, respectful of the property and leave it as they found it, if sometimes not a little better. The staff at WRD are great and there has never been a delay in payment or any issue that we could not address within a timely manner. You guys are great, keep up the extra effort." "The management and staff at WRD are absolutely the BEST! My husband and I were new to renting and Bill and his staff helped properly represent our property and prepare it for happy renters. They reviewed the property in person, provided guidance on rental rates, and also provided feedback to us when we were looking at improving it. We always got paid on time and always got feedback on what our cottage might need when we asked for it. Fran and Darlene are excellent and have always communicated well on all matters. This will be our 13th rental season with WRD and our cottage has been heavily booked each season. We have also made use of the WRD cottage change-over service as we live in Toronto, and that has been flawless. I would strongly recommend WRD to anyone looking at renting out their cottage property. You will not be disappointed." to finally rent a cottage in winter. Our winter page is up to date and we continue to add new winter cottages. So if you want to make that winter break happen, now is the time to start looking at what is available. assistance in finding that perfect cottage for your winter break !!! Do you have a question about cottage rental? and answers to your questions !!! Vacation Planners who will be happy to help you find the perfect vacation destination. stated on the individual cottage web pages? On the cottage web pages, the base price is stated near the top and or bottom of each page. In addition to this price, there is a $100 non-refundable booking fee plus applicable taxes and a $500.00 refundable security deposit if there was no damage, long distance phone or satellite charges, garbage left behind or extraordinary cleaning needed, in which case, the charges to rectify the situation would be deducted from your security deposit. How do I reserve a cottage ? Once you have chosen a cottage from our inventory, send us an e-mail from our web site and tell us which cottage you wish to reserve, the dates you wish to reserve the cottage and supply the email address you wish us to use to send your booking application. Also indicate who we should send the application to indicating if the fax number is at your home or office. When you receive the booking application, simply fill in the blanks and return to our office by return fax. The cost of renting a cottage through the agency which is itemized on your booking application includes the base rental rate and a booking fee of $100 plus applicable taxes. If you plan to pay for your cottage by credit card, the booking application will have a provision for your credit card number and authorization. We will then use your credit card to pay your initial deposit which is half the base rental amount plus the booking fee and applicable taxes. This deposit will hold the cottage you have chosen in your name for the dates of your vacation. Within 2 weeks of sending back your booking application, you will receive a confirmation package. Unless specified otherwise by you, your credit card will be used again to pay the remaining balance four (4) weeks prior to your arrival. At that time you will receive your final confirmation package. If you plan to pay for your cottage by cheque, we ask that a cheque for one half of the rental amount plus the booking fee and applicable taxes be forwarded as soon as possible. When the deposit has been received, your reservation will be confirmed. The remaining balance is due four (4) weeks prior to your arrival, together with a separate cheque in the amount of $500 which represents your security deposit. The security deposit cheque is not cashed unless needed and is returned to you approximately 45 days following your departure providing there are no additional charges incurred during your stay at the cottage. When the balance of the rental fee has been received, your final confirmation package will be sent to you immediately. What about the Haliburton County water draw down ? Throughout our web site we address and attempt to describe as best we can the issue of beaches at various properties within our cottage selection. For the most part, Haliburton County is a rocky area and subsequently most of the shorelines at our cottages are rocky but there are pockets of sandy shorelines throughout the county. However, the extent of beach or sandy bottom is dependent on a number of factors, not the least being the fact that Haliburton County is the watershed for the Trent Water System. 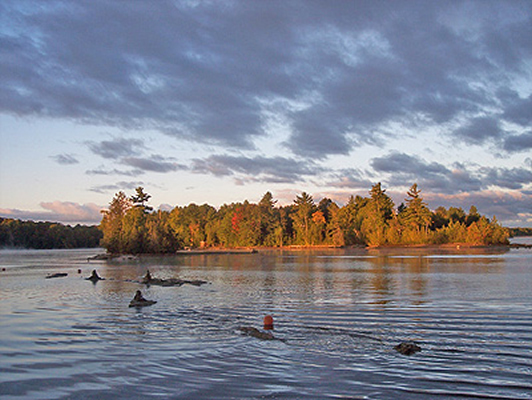 By federal law since 1903, if the Trent Water System needs water, the Ministry of Natural Resources removes some logs in the dams of the major lakes in Haliburton County and water flows to the Trent Canal. When these logs are removed from the dams, the water levels go down in our lakes and depending on the time of year, beaches appear or become bigger than they were before the draw down. If the weather has been inclement during the spring and early summer, there is a good chance that water was not needed in the Trent System and as such there may be more water and less beach than you expected at your cottage. The bottom line is that it is very difficult to predict when the draw down will occur and difficult to predict the amount of the draw down. In a normal year, the draw down starts to occur in the latter part of July and will continue through August and September. We ask for your understanding concerning the shoreline at the cottage you have rented.
" This signed contract also authorizes The Rental Agency to debit the renter's credit card for any costs incurred by the Cottage Owner or The Rental Agency relating to damages by the renter, excessive cleaning requirements, loss of dump card or key, long distance telephone charges or other costs ( to a maximum of $500 ) not covered in the rental agreement relating to occupancy of the cottage and use of any recreational equipment." In essence, with a credit card purchase, we have done away with the security deposit but by signing your booking application, you now understand that you are still responsible for costs incurred up to $500 per the above statement. When you rent a cottage from this agency, we ensure that the cottage is clean, organized and ready for occupancy before you arrive. Our field staff or owners check the cottage before your arrival to ensure that everything is in order. $500) not covered in the rental agreement relating to occupancy of the cottage and use of any recreational equipment. The deposit is kept for 45 days which gives the owner of the cottage time to receive his or her telephone bill and to notify this agency of any long distance charges during your stay at the cottage. Any long distance charges are deducted from your security deposit. You are asked to please use your calling card when making long distance calls. When you arrive at the cottage you will find a dump card or landfill permit which you will need when you take your garbage to the local garbage dump. If you lose this card, $25 will be deducted from your security deposit which is the cost of a new landfill card at the local municipal office. If you lose the key to your cottage, you will be charged $10 plus delivery charge for having a new key made and taken to the cottage. You are expected to return the cottage in the same condition you get it in. After your departure, our field staff or the owner checks the cottage again before the next renter arrives and if the cottage needs cleaning after your use or repairs have to be made, the cottage will be cleaned and the repairs done and cost of that cleaning and those repairs if needed, to a maximum of $500 will be charged to your credit card or debited from your security deposit. A full accounting of these charges will be forwarded to you by email. If you or someone in your group inadvertently breaks something, you are asked to please notify this agency out of courtesy to the owner and/or next renters. If garbage is left behind, you will be charged $5.00 per bag plus delivery charge for removal of this garbage to the local land fill site. Where do I get the keys and directions to the cottage? Unless you are told otherwise, all cottages within the WRD Cottage Rental inventory have a lock box attached to the door of the cottage. You will receive a map to the cottage and the code to open this lock box before your vacation. All you do when you arrive at the cottage is locate the lock box, punch in the code provided for your cottage, open the lock box, open the cottage door with the key from the lock box, return the key to the lock box and secure the lock box until the next time you need to open the door. When your vacation is over, ensure that the key is in the lock box and ensure that the lock box is indeed locked. When you first arrive at the cottage you will find your Household Rules and Information which will tell you everything you need to know about the cottage and where things can be found in the cottage. To open your lock box, simply punch in the numerical code for your lock box and then slide the top button down and towards you. face plate to the original position. The second button in the middle of the face plate is a "clear" button in case you make a mistake in entering your code. lock box, don't hesitate to contact us directly. Can we bring our pet to the cottage? If you have chosen a cottage which allows pets, yes by all means bring your pet. If your cottage information sheet which you received with your confirmation states that pets are not permitted then we are sorry but your pet or the pet of any guest will not be welcome. If you are staying in a pet friendly cottage, you are asked to keep your pet on the property at all times and that the pet is not to be left alone at the cottage while you are not there. If your pet likes to bark, we ask that you keep the barking to a minimum while the pet is at the cottage. The woods and forests around your cottage are inhabited by animals which could harm your dog such as bears, porcupines, skunks and frogs. It's a good idea and just common sense to keep your pet close by at all times. What do we have to bring to the cottage ? You are expected to bring your own sheets, pillow cases, towels, facecloths and life jackets (see below). Blankets and pillows will be at the cottage when you arrive. Other than your food and your own consumables, everything else is pretty well supplied by the owner of the cottage. You can certainly bring your food from the city if you wish but there are good food stores in the area for your convenience. Most cottage owners supply some spices and some toilet paper to get you started but you are asked out of courtesy to the owners or the next renters to replace these essentials before you leave. You should also bring your own PFD's (personal flotation devices) better known as life jackets. Every person in a boat of any kind in Ontario is required to have a life jacket. Life jackets are a very personal thing and you should go to a store where someone will help you to choose the right kind of life jacket and have it fitted properly. The owners of our cottages are instructed to NOT provide life jackets for renters as it is virtually impossible for the owner of the cottage to stock enough life jackets to fit all sizes of renters. Failure to have a life jacket while in a boat in Ontario could result in a heavy fine. Our waterways are now consistently patrolled by the Marine Division of the Ontario Provincial Police. In addition, every boat that leaves shore should be equipped with a bailer, a 15 meter floating rope, a waterproof flashlight and waterproof whistle. At the beginning of the rental season, our owners ensure that this equipment is supplied for each watercraft at the cottage. If this equipment is missing. it is up to you to ensure that these articles are in your watercraft before leaving the dock or shore to satisfy Ontario Safe Boating Regulations. This equipment can be purchased at any marina in the area. Once again, failure to have this equipment on board could result in a fine. Please Note - Portable hot tubs are not permitted at any of our rental properties without the expressed written permission of WRD Cottage Rental Agency. Why is there a limit on the number of people allowed at the cottage? First of all, this agency is contracted by the owners of the cottages to find suitable renters for their cottage. In other words, we work hard to fulfill the expectations of the owners. The owners indicate to the agency the maximum allowable number of renters at any given cottage. This is most important and is usually based on the capabilities of the septic system at that particular cottage. Unlike your home in the city, all waste from the toilets and the sinks remains on the property and exits the cottage into an elaborate maze of tanks and pipes under the ground around the cottage. This septic system is usually designed to service the number of people that the cottage can sleep. If too much waste is forced through the system, the system will back up and a plumber will be needed to rectify the situation. Believe us when we say, "You do not want septic problems during your vacation." The septic system is very sensitive to what it is expected to handle. Renters should only put single ply toilet paper in the septic system and care should be taken to only flush the toilets when absolutely necessary. Sanitary wipes, napkins, paper towels, grease or cigarette butts should never be put down the toilet. These items are sure to plug the system. Like the septic system, care should be taken with the use of water at the cottage. The water used at the cottage will either come from a well or will be pumped from the lake. Be conservative with the use of water regardless of where it comes from. Do not take a lot of showers back to back. Do not take showers while doing the laundry or the dishes. Take short showers rather than baths which consume a lot of water, Give the pumping system time to replenish the amount of water available. All of these factors help to determine the maximum allowable number of people permitted at the cottage. This agency will not tolerate renters who exceed the maximum allowable numbers at the cottage. We also ask that you limit day visitors to your cottage to a maximum number of 3 people. In other words if your cottage allows 6 renters, then you should never have more than 6 renters overnight and 3 guests during the day for a total 9 people on the property at any one time. The owners of the neighboring properties are asked by the owners of your cottage to keep an eye on the comings and goings at the cottage. If your neighbor sees things happening which are against the terms and conditions of your rental, or that there is excessive noise, your neighbor is instructed to call the rental agency. We in turn will visit the property to determine the problem. Your understanding and consideration of these factors will be greatly appreciated. here are directions from both East and West Toronto. Proceed east on Hwy. 401 past Pearson Airport to Hwy. 400. Go north on Hwy. 400 to Barrie. Stay on Hwy. 400 through Barrie and on the north side of Barrie, Hwy. 400 will automatically turn into Hwy. 11 North. Stay on Hwy. 11 North past Orillia and onto the Gravenhurst / Bracebridge area. In the Bracebridge area you will come to Hwy. 118 and the first mention of Haliburton. Turn right or east on Hwy. 118. You are now 45 minutes from Haliburton Village. Proceed along Hwy. 118, cross over Hwy. 35 and on to Haliburton. When you reach the Village of Haliburton, we are at #83 just past Emmerson Lumber and beside Bruce's Barber Shop. Take Hwy. 401 or the Don Valley Parkway to Hwy. 404 North and proceed to Newmarket. Exit at Davis Drive, turn right or east on Davis Drive and proceed to Hwy. 48. Turn left onto Hwy. 48. Follow Hwy. 48 which makes several turns so watch for the signs and eventually you will come to the end of Hwy. 48 in the Village of Coboconk at Hwy. 35. Turn left or north on Hwy. 35 and drive to Minden. Before Minden you will come to a sign for Hwy. 121 Kinmount, DO NOT TAKE THIS ROAD. You are looking for CR 21 Haliburton which is off of Hwy. 35 just north of Minden. Turn right onto this CR 21 and follow for 24 km to Haliburton Village. Once in the Village of Haliburton, proceed to the 3rd traffic light at Hwy 118 and turn left. We are 100 meters on your right at #83 beside Bruce's Barber Shop just past the entrance to a Plaza on your right. Where can I rent a boat in the area? Due to circumstances beyond the control of this rental agency, a motorized watercraft may be left at the dock of the cottage you are renting. Please note that this motorized watercraft is NOT part of the rental of the cottage and in no way should be used by the renter. If you wish to rent a motorized watercraft, there are several marinas in the Haliburton Highlands who rent watercraft, supply fuel, do maintenance and provide snowmobile supplies. If you are confused about licenses needed to operate a motorized boat in Ontario, visit the following web site for all the information needed. 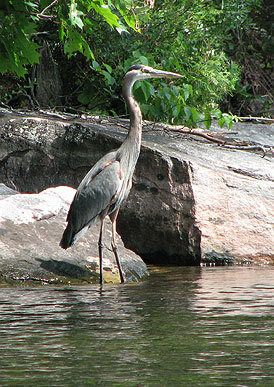 What kinds of wildlife will we see in the Haliburton Highlands? 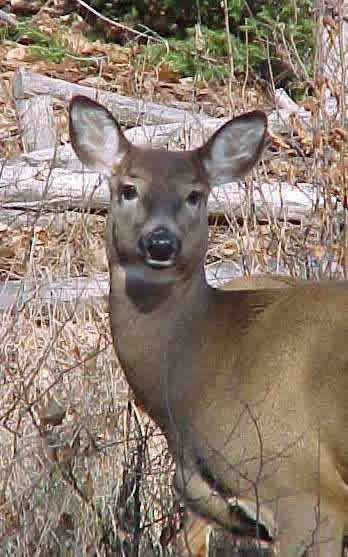 The Haliburton Highlands is home to many more animals than there are people. We are visiting their home and as such we need to pay a healthy respect for the animals which inhabit our forests. During any given day around your cottage you may see deer, moose, bear, fox, wolves, porcupines, skunks, raccoons, chipmunks, groundhogs, mice and hundreds of species of birds. Please do not feed the animals and by all means, ensure that your garbage is in a secure container if you put it outside overnight. If not, you will be picking up garbage from one end of your rental property to the next in the morning. In our lakes there are bass, trout, muskie, pike, walleye, pickerel, whitefish and splake. Hunting is permitted in season and fishing is one of the favorite pastimes in the north country. If you do fish, we encourage "catch and release". Permits are required for both hunting and fishing and these permits are available at several locations within the Highlands. So while you are in the Highlands, be kind to our animals. They are a precious resource and a joy for all to see. .......Where can I find information on hiking, biking, golf, skiing and snowmobiling and other attractions? There is lots to see and do in the Haliburton Highlands and information is readily available through the following organizations or web sites and phone numbers. Copyright 2019 [WRD Cottage Rental Agency]. All rights reserved.